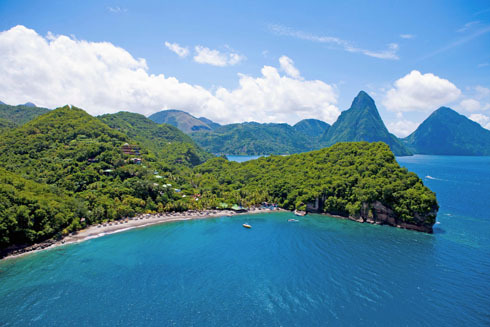 You won't have to go far to immerse yourself in the wonders of Saint Lucia's underwater world. Just yards from scenic beaches, coral reefs rise close to the surface and are clearly visible in clear Caribbean waters. Warm, calm waters invite extended explorations that will uncover a wealth of marine life. Turtles and majestic eagle rays glide past reefs decorated in multi-hued sea fans and swarming with tropical fish. Shy eels and scuttling crabs hide in crevices, and stealthy hunters camouflage themselves to resemble sponges or pieces of the reef as they await a passing meal. It's another world down there, but one that is yours to discover. Snorkel sites are located on the calmer western shore of the island, and most are close to shore. A number of premier sites can be reached with a short swim from the beach, while others are best visited by boat. A number of companies offer snorkeling excursions. Below the surface, snorkelers will find volcanic rock slopes covered in dense coatings of corals and sea fans. These growths provide shelter for a wide range of marine life. You'll see plenty of colorful corals, sea fans and tropical fish on the reefs of Saint Lucia, but some of the real treasures will require a closer look. Peek into crevices and you may find lobster, small moray eels or an octopus staring back. If you are swimming over the sand, look for the bizarre flying gurnard, which looks more like a bird than a fish when it spreads its pectoral fins. At Anse Chastanet Beach, it's just a short swim from shore to one of the most colorful coral reefs in the central Caribbean. A boat ride to the Coral Gardens is just the start of the adventure, as more than 150 varieties of fish and marine life await. When exploring the reefs at Anse Cochon, keep an eye open for passing eagle rays, and check under ledges where docile nurse sharks rest. If you have your own snorkel gear, bring it. If not, a number of hotels, tour boats and beach concessions provide equipment. To prevent sunburn, wear a form-fitting water shirt to keep harmful rays from your exposed back. Use a mesh bag to keep your gear organized on boat trips, and include a small waterproof carry case for electronics and valuables. GROS INLET - CARADONNA RECOMMENDS includes 7 night Ocean View accommodations, breakfast daily, 1 day Snorkelling including equipment (2 stops), Soufriere Island Delight Tour, Whale Watching/Dolphin Spotting, complimentary 30-minute body exfoliation at the The Spa at Windjammer Landing, free WiFi, roundtrip airport transfers, hotel tax and service charges. Valid 8/19/19-10/10/19. Book by 4/6/19. Additional dates available at varying rates. 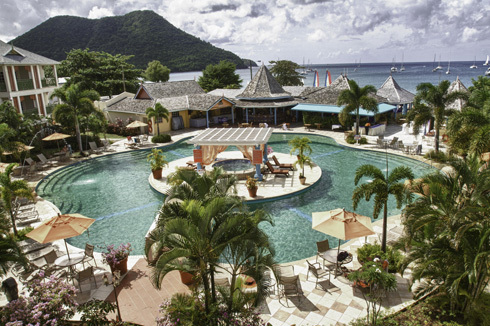 CASTRIES - The bodyholiday Saint Lucia is an amazing St Lucia resort experience. It is a unique combination of one of the world’s most beautiful islands, an all inclusive resort that provides a truly luxurious and personal service, a Wellness Centre that provides a range of treatments that will leave you feeling alive and a range of activities that could keep you busy from dawn until dusk.